Deutsche Bank hit headlines two years ago. Since then significant share of its assets were cashed in, few thousands of employees were sacked and the problems were gone. Gone or only forgotten? One is for sure, they did not disappear. Deutsche Bank is the second largest investment bank in the world. Cumulatively its assets are worth 2 trillion EUR and deposits peak over 570 billion EUR. The real problem of Deutsche Bank is its exposure on derivative market. 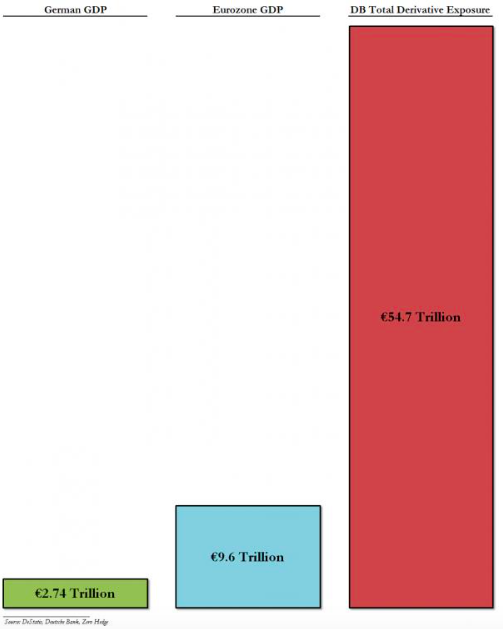 The sum of just under 55 trillion EUR is 20 times bigger than the GDP of Germany. Majority – 70% - of all derivatives are interest rate derivatives and they are secured with government bonds. Problems with huge pool of derivatives (only JP Morgan is ahead by small margin) were soothed in the last two years by the hike of government bond prices which are the pillar of securities of the derivatives. In February this year government bonds reached their top price (with yield close to zero). Afterwards prices started to fall and with them value of securities that hold together the whole pyramid of derivatives. - May 2014 – DB is selling 8 billion EUR of assets with 30% rebate to maintain liquidity. Losing cash flow and money is the quickest way to bankruptcy. - March 2015 – DB fails stress tests. Even Belgian DEXIA who days afterwards was insolvent did pass. - May 2015 – Authority of one of the DB chairman - Anshu Jain - were broadened to unsurpassed levels, this happens only in the dire conditions of deep crisis. - 5 June 2015 – Greece falls behind on its payments to the IMF, this has consequences for the DB. - 6 June 2015 (day after) – Two chairmen – Jain and Fitshen – resign of their post. It is clear situation of abandoning already sinking ship. Jain’s resignation is postponed till end of June while Fitshen agreed to stay till the end of May 2016. - 9 June 2015 – Rating agency Standard & Poor’s lowers DB rating to BBB+ (lower than the Lehman’s rating on the day of its bankruptcy and only 3 levels higher than ‘junk bonds’). Will Deutsche Bank be next Lehman? No one knows that but risk is high. The DB employs nearly 100 thousand people worldwide and value of its derivatives is higher than global GDP. What is worse is that the main security used here is government bonds that are losing its value continuously. Prices of bonds of the biggest countries lost 10-12% in just three months. For years interest rate market was being successfully manipulated but it seems that market forces finaly are breaking through. Market of bonds is big enough that there is no way for everyone to escape its consequences without creating a crisis. Today’s situation is operating on the first come, first served basis. Knowing that there is no liquidity (demand) in the market and with this scale central banks cannot save the day anymore. It is worth remembering that financial crises are happening once per 7 years, give or take. We had ‘black Monday’ of 1987. The Great Bond Massacre in 1994. The burst of NASDAQ bubble in 2000 is remembered by everyone just like the collapse of Lehman Brothers which nearly ended up dragging whole financial system down with it. The Deutsche Bank problem is serious because of many reasons. The DB is way bigger than the Lehman Brothers thus, scale of the potential damage is incomparable. Modern global financial sector resembles a system of communicating vessels. The interconnectedness is very strong. Problems of one bank nearly immediately creates domino effect onto other banks. Not only banks but also countries themselves are affected. What is more, central banks already exhausted opportunities to smooth out crises. Every single time in the past the quantitative easing (pumping money into the markets) was used and lowering interest rates to prevent credit crunch. Since 2008 rescuing financial institutions never ended. After half a decade the old methods are not viable option to save the day. Last but not least I attach the comparison of German GDP, Eurozone GDP and the DB derivatives Exposure. Food for thought. Lehman was like building seven to the grand scheme of 911? Conflict resolution events " after the veto today? with executives covered through the Wall Street Journal. informed that Wells Fargo would only make good on $250,000 of the $400,000 that bank employees drained from her accounts as soon as they opened shadow accounts in her own name.